Posted February 18th, 2018 by Mike Boyes & filed under Child Development, Clinical Neuropsychology, Language Development, Language-Thought, Neuroscience, Sensation-Perception. Description: Two questions before we get into this topic. First, who has strokes? Second, if someone has a massive left hemisphere stroke what will likely happen to their spoken language abilities? Old people and language will suffer right? Well, not entirely. You see, infants, and in fact, newborns (about 1 in 4000) can have strokes. The birth process is stressful and can involve huge spikes in baby blood pressure which, in turn, can lean to strokes. What are the impacts of such strokes, especially when they are large? Well, before you try to answer make sure your response involves using the term “plasticity.” If you are unsure what that means then read the article linked below to find out and even if you do know what plasticity is read the article to see if what it says matches your responses to the first two questions I posed above. Source: Newborn babies who suffered stroke regain language function I opposite side of brain, Science Daily. If you have had an introductory level Psychology course you have likely heard about Broca’s and Wernicke’s areas, their roles in the processing and production of spoken language and the finding that they are typically located in the left hemisphere of your brain. You also have likely heard about how stroke damage in the left hemisphere of the brain can be associated with mild to severe loss of language production or language processing ability (look up the two areas of the brain noted above for more information). All this is supported by a lot of research. But, if the person who has the stroke is a newborn language development and language processing may not be impacted at all and, in fact those tasks might actually be taken up by the right hemisphere of the brain. THAT is neural plasticity, where other brain areas take up functions that would “normally” be in areas of the brain damaged by strokes. An additional, and potentially quite important finding of the study reported in the linked article is that there are constraints on precisely what areas of the brain take over what functions following stroke. In other words language processing does not get written any old place but in specific regions of the right hemisphere following severe left hemisphere strokes. The researchers are looking ahead to study the molecular basis of plasticity as an understanding of those processes may be very informative as to opportunities for assisting in the recovery of function following stroke at any age. Why do some newborns have strokes? 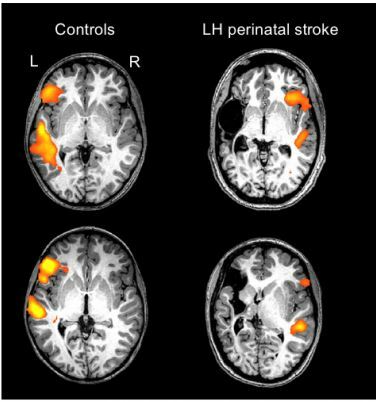 Why do newborns who have strokes often show little or no long term detrimental effects? Why might there be specific “back-up” areas for certain specifically located functions in the opposite hemisphere of the brain and how might that back-up function (or back-up potential) work?